One thing people are always in the mood for is a party. NO matter what type of party, or what age group, people love to get together and enjoy each others company with games, songs, activities and fun, fun, fun!!! For a party that's wet and wild it's got to be foam! Foam Parties are the newest craze among Teens and College Students! 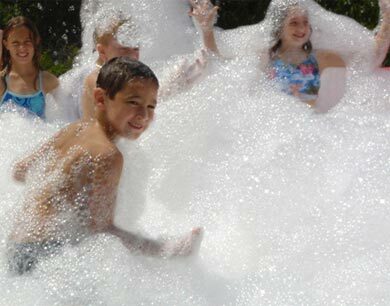 Get into your bathing suit and get ready to dance in the bubbles as the foam machines pump out the foam! Foam is awesome for all occasions! Birthdays, Field Days, Team Parties, Youth Groups, Church Parties, Night Clubs, Carnivals, School Events, Day Care Facilities, Festivals, Dances, Summer Camps, Club Events, Family Reunions, Company Picnics and even Beach Parties. You name it; FOAM will make it FUN. Our foam is non-toxic, non-allergenic, and harmless to grass, plants and clothes. Our skilled event planners can come out, set up the machine, run it and then take it all apart for you. Of course, it’s so easy that you don’t really need us to do it, but we’re happy to come out and make sure it’s one less thing for you to take care of so that you enjoy the fun!